Clay standout Dakota Dodds took home a state championship with the Rock Hill Senior League squad over the past weekend. 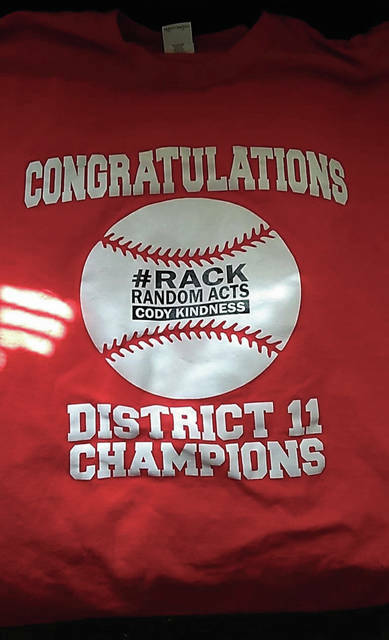 The Rock Hill t-shirts that were funded by Cody Gollihue’s mother, Lea Ann, in honor of Random Acts of Cody Kindness. Rock Hill has worn these jerseys throughout tournament play. In his outstanding two-year career, Dakota Dodds has done a lot of things. He’s led the Clay baseball program to back-to-back Division IV District appearances at VA Memorial Stadium while contributing to a squad that’s won 33 games in two seasons. 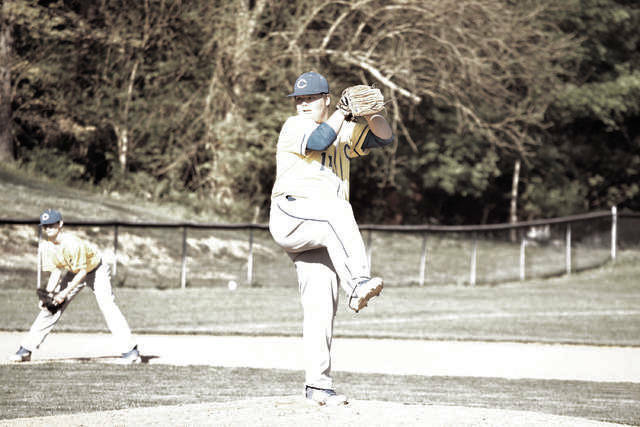 He’s earned All-State honors in the same sport via Prep Baseball Report (PBR) Ohio by collecting an ERA of under 1.9 on the hill. And, in soccer, the standout goalkeeper collected an incredible 36 saves against a Northwest soccer team that advanced to the Division III Regional Semifinals. Over the past weekend, Dodds, who starred as a pitcher and at the plate for the Rock Hill Senior League unit, led the Redmen to a fantastic run as Rock Hill claimed a state championship under the direction of Carl Blankenship. And, amazingly enough, it all started with RACK. If you’re wondering what in the world that means, it’s Random Acts of Cody Kindness, hence the four-letter abbreviation that exists today. It’s in honor of the late Cody Gollihue, who played baseball as part of the Raceland (Ky.) High School baseball program. Cody, a four-year letterwinner at Raceland, passed away on May 26, 2017, in a car wreck on Interstate 64 in Huntington, W. Va. Following his death, Cody’s parents, Elliott and Le Ann Reeves-Gollihue, and his sister, Ellie, formed the Facebook page that would garner an incredible amount of interest across the country and world as a way “to share random acts of kindness in Cody’s name” and to honor the memory of the person that “loved doing random acts of giving and nice things for people,” according to the RACK Facebook page. Since its creation, the group has 110,149 likes on the social media website — in just a year and two months time. Now, in addition to galvanizing kindness towards the common individual, the group also has credit toward galvanizing an entire baseball team. In District 11 competition, Rock Hill’s poise showed in critical moments as the Redmen won each of its District 11 contests by three runs or less (9-7 over Fairland, 3-0 over Chesapeake, and 6-5 over Fairland in eight innings) to claim the title and advance to the state realm, with Evan Cremeans’ RBI base knock — which drove in Caleb Dillon — doing the primary honors. The victories, however, were only a precursor of what was to come, because, in the opening contest at the Ohio Little League Senior League Championship Tournament, Dodds made a statement that proved that Rock Hill was there to stay. In its first contest, which came against Maumee, Dodds did everything but fill up the Gatorade cooler. In six innings, the junior-to-be struck out eight batters while only walking three for a 2.66-to-1 strikeout-to-walk ratio. He allowed just one hit during that same timeframe. And last, but not least, his single in the fourth inning led to the only run of the contest in a 1-0 victory as Hayden Harper’s double scored Dodds for the difference-making tally. After a 5-0 setback to East Holmes, Dodds came up big again by going 3-for-4 with two doubles and four RBI — outproducing the entire Mason team by himself — in a 10-3 victory to set up a rematch with East Holmes. By that point, Rock Hill wasn’t to be denied. “I don’t think I’ve ever experienced something as great as playing with these guys,” Dodds said. “We feel excited and humbled to be representing Ohio. It’s a dream come true. Brayden Friend’s our main centerfielder and one of the best athletes I’ve ever met, Nick Blankenship’s a great ball player, and Jordan Griffith, Hayden Harper, Jake Schwab, and Evan Cremeans always lift me up when I’m down. Caleb Dillon, Joe Pierce, Casey McCormick have been huge for us, and then, there’s Owen Hankins. Me and that kid always have a great time on the field. He will always put a smile on your face, whether it’s playing Fortnite (video game) in the hotel rooms or playing on the field. He’s also the youngest player on our team at the age of 14. He’s really stepped up. But really, all of the players have — because they fought to accomplish goals that were bigger than their personal wants, and did so. With their state title, Dodds will be playing with the Rock Hill Senior League group at the Great Lakes Regional Tournament in Peru, Ill. and Ogglesby, Ill. They’ll play the Illinois and Kentucky State Champions on Saturday, July 21 to begin tournament action.